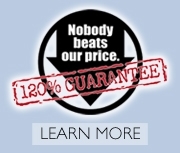 At Becker Furniture World, we want to be where our customers are: online. Because of this, you can find us on the following social media platforms: Facebook, Twitter, YouTube, Pinterest and Instagram. We also interact with customers on our website and blog. These Guidelines will give you an outline of how to engage and interact with us online, and what expectations to have when interacting with us online. Please note that responses to online posts will typically take place between 9 a.m. and 9 p.m. Monday through Friday, when our social media team is in the office. Our Facebook page is a place where we share information and interact with our followers. 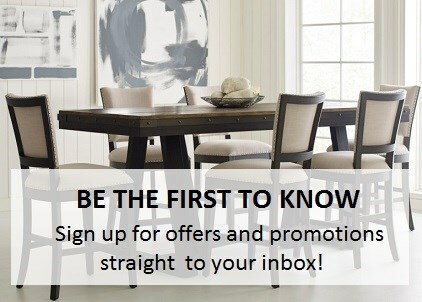 We post images from our showrooms, decorating tips, updates on the current promotions or sales and the occasional contest. We love to see comments from our customers and appreciate feedback. Before interacting with us on Facebook, please review the guidelines listed below. If you would like to interact with us, we ask that you be courteous to us and those who also want to engage. Lewd behavior like profanity, bullying, harassment or attacks will not be tolerated. Please try to keep your comments on-topic to posts and contribute to the conversation. Content like spam, off-topic comments or third-party links may be removed. If you have a Customer Service question, issue, idea or complaint, we ask that you reach out via phone to your preferred store and they will connect you with a member of the Customer Service team. Or, feel free to contact us through our Contact Us page, through our feedback form on Facebook or by calling our main number at 763-262-9000. If a comment is posted to our Facebook page, we will reach out to the individual, but the customer service post will be removed. Any posts that do not follow the above guidelines may be removed. Twitter is a great place to figure out what is happening right now. Our goal is to provide you with interesting content about furniture, decorating and design. We use our twitter account to share decorating ideas, update our followers on our current sales or promotions or display stylish store setups. One of the goals of our twitter account is interaction. We love to communicate with customers, and do our best to respond to as many questions and comments as we can, but we may not be able to respond to all. When you tag us in a post, please try to do so in a way that adds to the conversation. Tweets that include inappropriate behavior like bullying, profanity or attacks will not be responded to. We are unable to assist customers with store or service issues through our Twitter account. If you have a customer service issue, please reach out via phone to your preferred store and they will connect you with a member of the Customer Service team. Or, feel free to contact us through our Contact Us page, through our feedback form on Facebook or by calling our main number at 763-262-9000. YouTube is one of the major centers of the Internet for video content. The goal of our presence on YouTube is to provide you with informative videos about furniture, decorating and our current promotions. We use our YouTube account to post our current TV ads and sometimes post decorating or design tips. We also appreciate comments on our videos. We will do our best to answer any questions you may have. If you write a comment, please try to do so in a way that adds to the conversation. Comments that have inappropriate behavior like bullying, profanity or attacks will not be responded to. We are unable to assist customers with store or service issues through our YouTube account. If you have a customer service issue, please reach out via phone to your preferred store and they will connect you with a member of the Customer Service team. Or, feel free to contact us through our Contact Us page, through our feedback form on Facebook. You may also call our main number at 763-262-9000 for assistance. 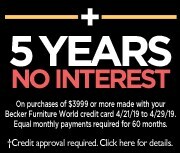 Any video that Becker Furniture World favorites or comments on does not communicate an endorsement of that company, service or view by Becker Furniture World. We do our best to review content before it is posted, but cannot control what others may post. Pinterest is a great resource for companies like us who often use photos for design inspiration. We like to use our Pinterest page to highlight product from our website, share decorating tips, host contests and create boards for design. We love to receive questions or comments on our boards and pins. We will do our best to answer any questions you may have and try to respond to as many as we can. If you choose to interact with us, we ask that you contribute to the conversation. Any text or comments deemed inappropriate will not be responded to and/or deleted and reported. We are unable to assist customers with store or service issues through our Pinterest account. If you have a customer service issue, please reach out via phone to your preferred store and they will connect you with a member of the Customer Service team. Or, feel free to contact us through our Contact Us page or through our feedback form on Facebook. You may also call our main number at 763-262-9000 for assistance. Instagram is a great way to show off daily photos. We use our Instagram account to post images of displays in our showrooms or updates of in-store events. We appreciate interaction and comments on our Instagram page. We do our best to answer any questions asked and try to respond to as many as we can. We ask that any comments posted be pertinent to the overall conversation. Any text or comments deemed inappropriate will not be responded to and/or deleted and reported. We are unable to assist customers with store or service issues through our Instagram account. If you have a customer service issue, please reach out via phone to your preferred store and they will connect you with a member of the Customer Service team. Or, feel free to contact us through our Contact Us page or through our feedback form on Facebook. You may also call our main number at 763-262-9000 for assistance.